Although it's only been a few days since my last "revival" post, my mind has been running at such a crazy pace. Between every day life and work, it's hard not to get caught up in it. Since I am going to use this place to talk about every day life, work, traveling etc., it would probably be wise for me to get you up to speed so you know what I'm referring to. Time to briggity-break it on down for ya! Brandi and I have lived together for over 7 years and have dated for 8 years this coming May. We recently got engaged on October 29, 2010 and have been planning our wedding since the beginning of the year. It's been such a great experience and I've learned so much about myself, Brandi and us as a couple. It's crazy to think that I am marrying the girl I dated back in the 7th grade. I see some of my younger cousins growing up and realize I was that age when I first locked eyes on Brandi. From there, I did every awkward, funny (or so I thought) or obnoxious thing you could imagine to get her attention. Clearly, it worked. Here we are many years later planning the biggest day of our lives together. As much as Brandi and I are independent, we owe a lot of what is happening to the support being offered by our family and friends. They're second to none and we're blessed to share this special time with them. Overall, the past year has really been life changing for me. 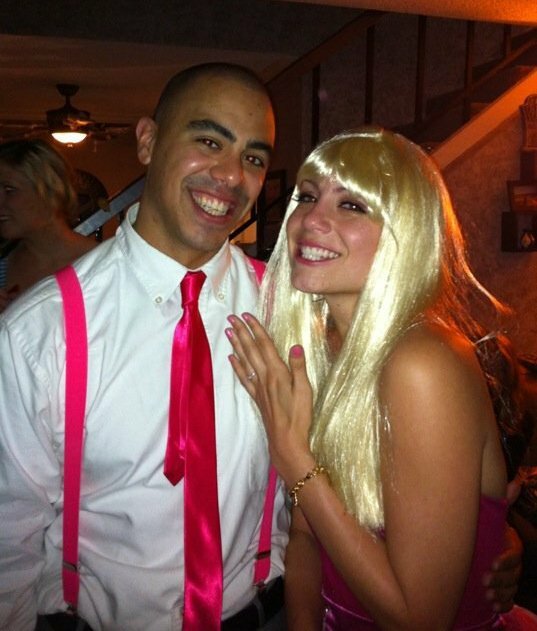 Not just because I got engaged but even leading up to the engagement was pretty crazy. Keeping a secret like that was much harder than I ever anticipated. I wanted it to be so perfect and it turned out exactly how I planned. After we got through the crazy holiday season (we have massive amount of family members on both sides), the wedding planning began. Let me tell you how awesome it is being engaged to someone who LOVES event planning. Not to say I don’t know how to plan anything but this is where I have let Brandi take the lead. This is like the Indy 500, Daytona 500, Super Bowl, World Series etc. all combined into one event for us. With her passion and experience for event planning, what is normally a nightmare for most people has become something the two of us have enjoyed so much. Not only that, we have become even closer to each other. Hard to believe but it’s true. We used to be some wild and crazy kids and don’t get me wrong, we still have it in us but nowadays (like this past weekend), it’s staying home together watching TV sipping on a fresh vodka/soda that seems to make me the happiest. Being far beyond passionate for all things automotive, my career path over the past 6 years has been exactly that; all things automotive. From selling lifts and heavy-duty shop equipment to shops and overseeing a NASCAR sponsorship for GES, my most recent venture was with WebRidesTV. I handled many aspects from online advertising, car reviews, photography, event coverage, video production etc. During those few years, I thought I had the perfect gig. In many people’s eyes, I did. But with the support of Brandi and her knowing my true potential, I started to look elsewhere. I had pretty much soaked up all that was being offered and hit a plateau so to speak. After months of discussions, I was given an opportunity that I have wanted for a long time. A place where I could plant my feet. Some place that was going to test me like I haven't been tested before yet offer me opportunities that only hard working, determined and focused people get. Well, lucky for me, I landed it. Since then, I've been doing things and going to places that just a few years ago were dreams of mine. 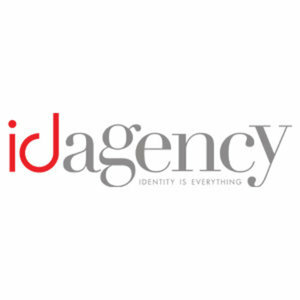 I'm now with the ID Agency based out of downtown Los Angeles. We are a PR and Ad Agency that focuses on the automotive and motorsports industries. We have some very large clients that will remain nameless for the time being. My duties can range from event coordination, social campaigns, online advertising, media buys and overseeing website development. With the amount of clients we work with and the amount of projects that are being done simultaneously, I found out very quickly that balance is going to be key. Not just balancing work related things, but balancing work and my personal life. Although I give my all to work, I also need to give my all to my fiance, family and friends. But if I'm giving my all to one thing, how can I give my all to other things? It’s already been an interesting, challenging, exciting journey that I am grateful to experience. My dad is actually one of the main reasons behind my automotive/motor sports infatuation. Let’s put it this way, my mom was pregnant with me and they were already taking me to the track. 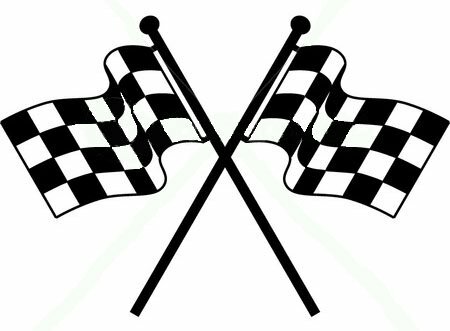 Growing up as a child, I spent more time at a racetrack than doing anything else. I wouldn’t change that one bit! The track was my dads “happy place” as it is for me. It’s the one place I can go and feel most connected with him; especially Willow Springs. Yesterday was actually my dad’s 60th birthday. He passed away in Dec. of 2002 so days like yesterday are generally rough for me. I typically psych myself out a week or so prior and constantly remind myself, it’s okay, he’s watching over us. But with how hectic things have been, I guess I just forgot. Not about his birthday but about mentally preparing myself to just get through the day without being a wreck. Not that there is anything wrong with being a wreck, but it’s just not me. On my way to work, I decided to stop off at Forrest Lawn where he is buried to pay my respects and wish him a happy birthday. My ritual for visiting him is to make 2-checkered flags and stick them in the ground in front of his head stone. It’s my way of letting him know I was there. As I stuck the flags into the grass, I quickly found myself in tears. With all that is going on in my life, it’s so hard to grasp that I can’t physically share this experience with him. For his entire life, he fought and worked so hard get what I am now experiencing. I hope that in heaven, people are able to feel proud while watching over us. Thank you dad for putting me on the right track in life and hope you had a good birthday. After such a mentally exhausting day of working and thinking so much about my dad, Brandi and I ended the day by a sharing a nice Italian dinner with my mom, sister and cousin Vanessa. I definitely need it, that’s for sure. Every so often, someone will ask Brandi or myself how we do it. How are we only 28 years old and have been together longer than most marriages last (at least in Los Angeles). There are many reasons but here is just one of them. I went to open my closest door this morning and found this miniature note taped to the door handle. The fact that Brandi knew the type of day I had yesterday, while she’s fighting the flu, she still managed to take the time to make sure I have a good day. Things like this mean the world to me! It’s not about the materialistic things; it’s about showing you care. That’s exactly what she did and that is just one of the many reasons I am and will always be her biggest fan. I love you Brandi. i love everything about this post. im so proud of you baby!! You both are amazing and such a beautiful couple. Wishing you both ALL THE BEST!!!!! Linked to your blog through your wonderful and beautiful fiance Brandi and I just had to stop by! You are both so adorable an I have loved following your adventures together...so excited about your upcoming wedding! What you say about her here is so sweet and I agree...it is those little things that show someone cares that mean the most! I wish you to all the best, but know you won't need it!